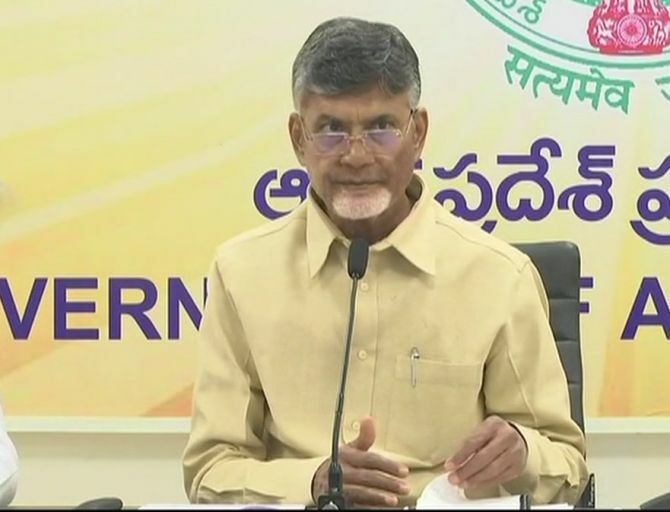 Taking exception to the prime minister addressing him as 'father of Lokesh' at a rally in Guntur on Sunday, Andhra Pradesh Chief Minister N Chandrababu Naidu launched a counter-offensive by dragging Narendra Modi's wife into the row. The Telugu Desam Party president said he loved his family and respected it. Naidu, who had earlier welcomed demonetisation when it was announced on November 8, 2016, now called it a 'mad Tughlaq act'. "They scrapped Rs 1000 currency note but brought in Rs 2,000 note. How will corruption end," he asked. The TDP had quit the National Democratic Alliance in March last year protesting against the 'injustice' done to the state post-bifurcation. Naidu alleged the opposition Yuvajana Shramika Rythu Congress mobilised crowds for the prime minister's public meeting at Guntur as the Bharatiya Janata Party totally 'lost' public support in the state. "Modi's AP tour is an utter flop. BJP should realise that people registered their protest by not attending Modi's meeting. "It has been established again that Telugu people would teach a lesson to those who betrayed them," Naidu later told his party leaders. "The prime minister claims to be a chaiwala but look at his suits and boots....," the chief minister said.